Due to logistical conflicts, the mattress fundraiser has been canceled. Please consider making a donation to our hard working PTSA by visiting their page here. Albany High School offers Advanced Placement (AP) classes in many subjects, and AP classes are popular with AHS students. But some AHS students make themselves miserable by trying to take as many AP classes as they can—often in subjects that don't interest them—in the mistaken belief that this is the only way that they will be admitted to a "good" university. Other AHS students assume that AP classes aren't for them or for "students like them," and either don't sign up for AP classes or don't do the things they need to do early on to prepare for AP classes in their final years of high school. In this information session, AHS Principal Alexia Ritchie, AHS Coordinator of Alternative Education Darren McNally and AHS Teacher Kevin James will discuss how to help your student decide whether to take AP classes (and how many), and the things your student should do to prepare for AP coursework. Need a mattress? Look no further, AHS PTSA for the rescue! We are partnering with CFS (Custom Fundraising Solutions) to bring the best deals to your doorstep (AHS GYM)!!! This is an AHS PTSA fundraiser, all the funds raised go towards supporting students education and overall experience at AHS! Have a question? Ask your friendly AHS PTSA board at ahs-ptsa@ausdk12.org . AHS PTSA supports AHS clubs, AHS theater program, AHS Senior Grad Night, teachers (via mini grants),and many other initiatives. Our sole purpose is to help create and maintain the support and safety net our AHS students need. Please consider donating here. Theatre Ensemble presents “Little Shop of Horrors” 3/7 – 3/9 at the Albany High School Little Theater. Don’t miss out on this amazing show. Buy your tickets now before the sell out at Brown Paper Tickets. At the performances, we will be auctioning off tickets to shows at Berkeley Repertory Theatre and Shotgun Players as well as some smaller items. We look forward to seeing you at a show! Join the Athletic Boosters upstairs at Club Mallard on Thursday, March 7th from 4-7p. Come mingle and have drinks and snacks with community and friends. 50% of proceeds will go to supporting our athletic programs and student-athletes. You can support Albany High School by becoming a Basementeer! Sports Basement is spinning the traditional “loyalty” program into a win-win for their loyal customers and our community. Basementeer’s receive 10% and give 10%: 10% off every item every day, 10% of profits back to local schools & charities, including Albany High School. Please watch this one minute video to get the idea. 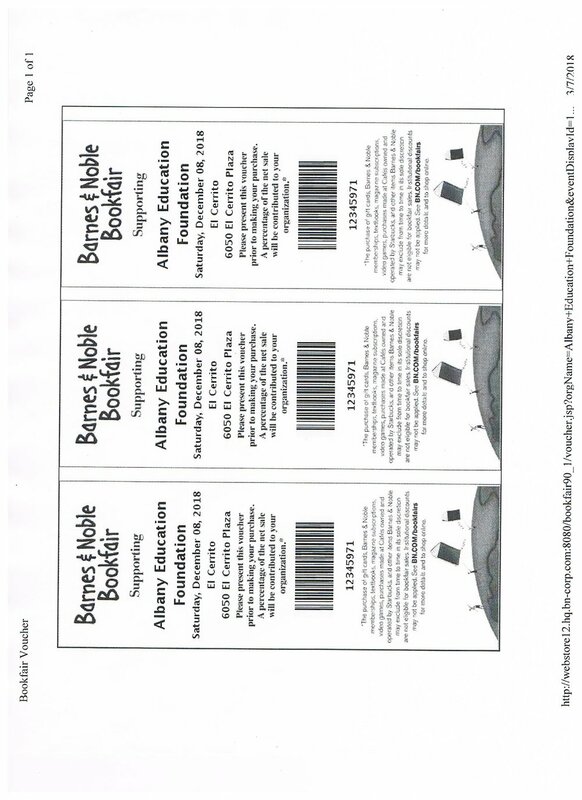 On your next visit to Sports Basement, register as a Basementeer and select Albany High School as your beneficiary! Support your favorite charitable organization every time they shop with Amazon. Shoppers who start at smile.amazon.com will find the same Amazon they know and love, with the added bonus that Amazon will donate a portion of the price of eligible purchases to the charity of your choice. Visit smile.amazon.com, sign in with your Amazon.com credentials, choose Albany High School PTSA charitable organization to receive donations, start shopping! Note: Please consider supporting Albany businesses and shop locally whenever possible! The Albany Education Foundation (AEF) and the Albany Community Foundation (ACF) are once again joining forces to host the Chocolate and Champagne Gala on Saturday, March 16, 2019 from 7:00-10:00 p.m. at Northbrae Community Church, 941 the Alameda in Berkeley. This special evening will include champagne, wine and beer, chocolate and non-chocolate desserts and savory treats. Albany High School musicians who delighted attendees last year, will once again perform. Many delightful offerings will be available at the silent auction. Tickets are $30, which includes a complimentary glass of champagne and desserts. Beer and wine will be available for purchase. Tickets, which make delightful gifts, will be available soon and I am happy to deliver them to you or they are available at the door. Serving champagne and delectable chocolates, cheese, and fruit, this event is the perfect ending to an evening out. This is the main fundraiser for these two wonderful organizations who do so much for the Albany community. Please see our website, www.albanyeducation.org for more information about AEF and www.albanycommunityfoundation.org to learn about the Albany Community Foundation. CFS (Custom Fundraising Solutions) representative will walk us through the details of the mattress fundraiser. is a way for customers to support their favorite charitable organization every time they shop with Amazon. Shoppers who start at smile.amazon.com will find the same Amazon they know and love, with the added bonus that Amazon will donate a portion of the price of eligible purchases to the charity of your choice. Visit smile.amazon.com, sign in with your Amazon.com credentials, choose Albany High School PTSA charitable organization to receive donations, start shopping! Your local bands "Controlled Burn" and “The Serotonins” will perform, to benefit SchoolCARE. Doors open at 7pm. Music starts at 8pm. Let's enjoy some live music and good company, while helping our Albany Schools! Please contact us at ahs-ptsa@ausdk12.org if you have any questions. AmazonSmile is a way for customers to support their favorite charitable organization every time they shop with Amazon. Shoppers who start at smile.amazon.com will find the same Amazon they know and love, with the added bonus that Amazon will donate a portion of the price of eligible purchases to the charity of your choice. Visit smile.amazon.com, sign in with your Amazon.com credentials, choose Albany High School PTSA charitable organization to receive donations, start shopping! Sports Basement You can support Albany High School by becoming a Basementeer! Sports Basement is spinning the traditional “loyalty” program into a win-win for their loyal customers and our community. Basementeer’s receive 10% and give 10%: 10% off every item every day, 10% of profits back to local schools & charities, including Albany High School. Please watch this one minute video to get the idea. 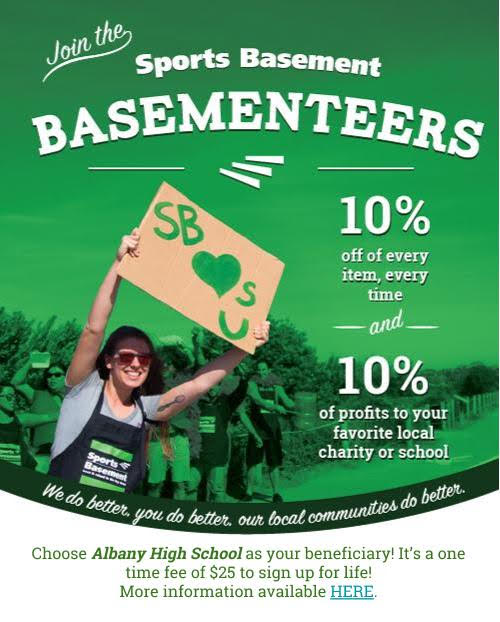 On your next visit to Sports Basement, register as a Basementeer and select Albany High School as your beneficiary! Our newly-designed fundraiser of the season features music across all styles, genres, and time periods (including Disney, Renaissance, and classic decade hits). Throughout the event, be ready to be entertained musically and filled to your heart's content with all-you-can-eat desserts! We'll have plenty of cookies, cupcakes, brownies, pies, and other assorted faire (with a good helping of fresh fruit, gluten-free, and vegan-friendly options). Tickets are $15 at albanyvocalmusic.com/dessert or via any AHS choir student. We hope you'll be part of a new annual tradition and help put this new fundraiser on the Albany map! Join us at Little Star for First Monday on December 3rd, and Albany schools will be the winner! The generous owner of Little Star continues his offer to donate 10% of what YOU spend on the first Monday of every month to the Albany Education Foundation. Lunch, happy hour, dinner, and take-out orders count ! Join us at 1181 Solano Avenue on Monday, or call 526-7827 for take out. For many years, the Albany Education Foundation has held a shopping day at the El Cerrito Plaza Barnes & Noble. If you come to El Cerrito Plaza to shop, you must tell the cashier that you want your purchase to benefit AEF. That day, the cashiers should have our number at each register. Purchases of books, LEGO sets, even a coffee in their cafe all count toward our total IF you remind the cashier. Join AHS PTSA Silent Auction team - we are busy planning AHS PTSA silent auction happening in February 2019, contact us at ahs-ptsa@ausdk12.org if you can help! Please join PTSA board at AHS Library on December 4th 8-9pm for AUSD Budget Presentation parent ed night, presented by Superintendent Val Williams. Superintendent Val Williams will give a presentation on the coming AUSD budget cuts and share what the Budget Advisory Committee has been doing. This committee will be presenting their report to the AUSD Board of Education on Tuesday, Nov. 13. These budget recommendations will be used to make final decisions on the budget cuts starting next year. AUSD is facing over 2 million dollars in cuts next year, with even more in the years to come. This is an opportunity to stay informed and hear directly from our superintendent about how decisions are being made. This issue has the potential to have direct impacts on our students. The Habit Burger Grill will donate 20% of sales from this event to benefit AHS PTSA. Simply present a printed flyer or show offer on your smartphone, download the flyer here. This fall (until the end of November), 5% of every grocery order you place on Good Eggs will go back to Albany High School! Enter the code ALBANYCOUGARS –– click "Shop Now. Add your groceries to your Good Eggs basket and check out. New customers get $15 off with this code and if 20 new customers join the fundraiser, the school gets a $500 fundraising bonus. Please consider joining if you order your groceries online! Albany High School PTSA is hosting Career Fair Day on November 8th 11:30-12:30 (check-in at 11:00am in AHS main office, 603 Key Rte Blvd, Albany, CA 94706). We plan to have 50+ professionals from various industries share their experience/passion/advice with our students. All volunteers will be seated at the pre-assigned tables in a dedicated open space location (most likely the baseball field adjacent to AHS main building). The students will be given a floor plan and the volunteers' background summaries ahead of time, then the students will have the opportunity to move freely between the tables based on their interests/who they want to hear from first. There is going to be an opportunity to share your experience as well as answer students' questions. We also welcome themed hands on activities if any volunteers would like to prepare any. Please let us know ahead of time if you need help setting the activities up. We would love for you to come and inspire our students!!! Contact ahs-ptsa@ausdk12.org if you have any questions. With love, your PTSA board.